The 2003 Bakken Oilers are coached by Danny Hanson and Stacey Diehl. Players are from Western North Dakota, Grand Fork and Fargo, ND and Phoenix, AZ. 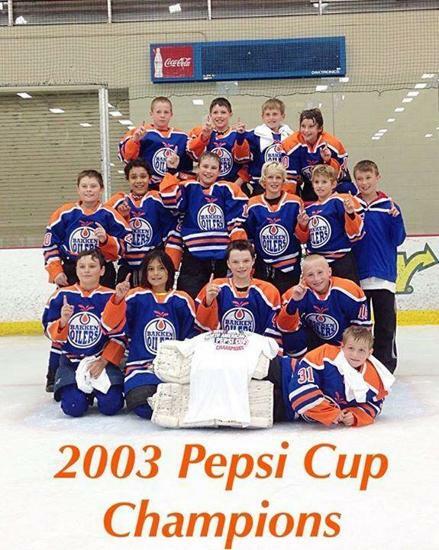 2003 Bakken Oilers Win Pepsi Cup! The 2003 Bakken Oilers are champions of the North American Pepsi Cup! Despite the tough competition from all over North Dakota, Minnesota and Canada, the 2003 Bakken Oilers proved that they are an elite team by taking the first of what could be many championships over the coming years. Coached by former Lake Superior State University hockey player Danny Hanson, the team showed both skill and grit in winning the close grind it out games and the wide open fast paced skill games. This team is versatile and skilled enough to compete with the elite teams across the region and expects to continue its success as the 2014 AAA season moves on.